With a little more than a quarter million hits to this blog I thought I'd take a look and see who is responsible and the results are that 80% of readers are responsible for 20% of the hits. Leaving the top 20% of "readers" responsible for 80% of the hits. 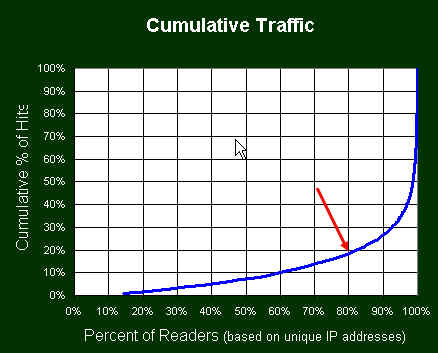 Most of the top 5-10% of the "readers" are search index robots and rss readers who hit the site several times per day. Thanks go out the percentage of my audience which is living and breathing. What is the underlying principle for the 80/20 rule? The next article is Pareto and the 80/20 Rule.